The tutorial demonstrates different ways to convert time to decimal in Excel. You will find a variety of formulas to change time to hours, minutes or seconds as well as convert text to time and vice versa. Because Microsoft Excel uses a numeric system to store times, you can easily turn hours, minutes and seconds into numbers that you can use in other calculations. In general, there are two ways to convert time to decimal in Excel - by changing the cell format and by using arithmetic calculations or Excel time functions, such as HOUR, MINUTE and SECOND. Further on in this tutorial, you will find the detailed explanation of the first way and formula examples demonstrating the other technique. Overall, there are three ways to change a time value to a decimal number: arithmetic operation, CONVERT function or a combination of three different Time functions. To convert time to a number of hours, multiply the time by 24, which is the number of hours in a day. To convert time to minutes, multiply the time by 1440, which is the number of minutes in a day (24*60). To convert time to seconds, multiply the time time by 86400, which is the number of seconds in a day (24*60*60 ). In the following sections, you will learn the other methods of converting times to a decimal number in Excel. This section demonstrates 3 different formulas to convert hours from the standard time format (hh:mm:ss) to a decimal number. The same three methods can be used to convert minutes from the standard time format to a decimal number. Converting time to total seconds in Excel can be done in a similar fashion. If any of the above formulas returns a value formatted as time, simply change the cell's format to Generalto display it as a number. To convert time to a decimal number that represents the time in the internal Excel system, apply the General format to the cell. With this approach, 23:59:59 will be converted to 0.99999, 06:00 AM to 0.25, and 12:00 PM to 0.5. If an integer part of the converted number is greater than zero, it means that your cell contains both date and time values. As is often the case, your Excel worksheet may contain dates and times in one cell, while you want to split them into two separate cells. Remembering that in the internal Excel system the date value is stored as a whole part and the time value as a fractional part of a decimal number, you can extract the date using the INT function, which rounds the cell value down to the nearest integer. 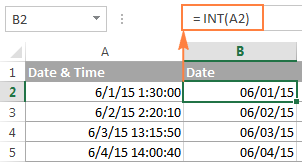 Where column A contains the original date & time values and column B contains the dates returned by the INT function. Tip. If the separated date and time values are not displayed properly, change the format of the new columns to Date and Time, respectively. This is how you split date and time in Excel. If you want to further separate hours, minutes and seconds into individual columns, then use the HOUR, MINUTE and SECOND functions, as demonstrated in How to get hours, minutes and seconds from a timestamp. Concatenate all parts in a single formula. Having difficulties with figuring out a proper formula for your worksheet? The following example will make things easy! Supposing you have the dates of upcoming events in column B beginning in cell B4, and the current date and time returned by the NOW() function in cell B1. The formula to calculate the time difference is as simple as =B4-$B$1. 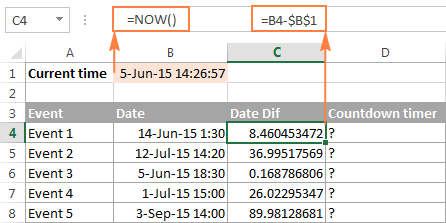 Of course, nothing prevents you from subtracting the current date and time directly with =B4-NOW(). And now, let's make a countdown timer that would show how many days, hours, minutes and seconds are left until each event. =INT(C4) & " days, " & HOUR(C4) & " hours, " & MINUTE(C4) & " minutes and " & SECOND(C4) & " seconds"
Note. When either of the above formulas refers to a negative number, the #NUM! error will appear. This may happen when you subtract a bigger time from a smaller one. An alternative way to write time in words in Excel is to apply the following custom time format to the cell: d "day," h "hours," m "minutes and" s "seconds". No formulas and no calculations are required! 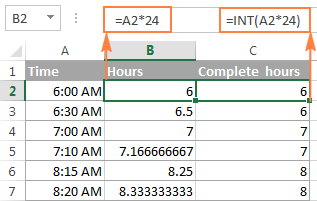 For more information, please see Creating a custom time format in Excel. If your time formulas and calculations do not work right, time values formatted as text is often the cause. The fastest way to convert text to time in Excel is using the TIMEVALUE function. As you see, the formulas with cell references and corresponding text strings deliver identical results. Also, please notice the left alignment of time strings (text values) in cells A2 and A6 and right-aligned converted time values in column D.
Supposing you have an Excel file full of times formatted to look like "8:30:00 AM" and you want to convert them to the text format. Simply changing the cell's format to TEXT won't work because this would change your time values to underlying numeric representation of the time. For example, 8:30:00 AM will be converted to decimal 0.354166666666667. If you have a list of numbers such as 1, 2, 3.5 and you want to convert them to a time format, for example 1:00:00, 2:00:00 or 3:30 AM, perform the following steps. Divide the numbers by 24 (there are 24 hours in a day). The formula can be as simple as =A2/24. Select the cell(s) with the formula result, right-click and select Format Cells from the context menu or press Ctrl+1. Either way, the Format Cells dialog will appear, you select Time on the left pane under Category, and choose the format you want on the right pane under Type. Please see How to apply or change the time format in Excel for more details. That's all for today. If someone wants to get the first-hand experience with the formulas discussed in this article, you are most welcome to download the Sample workbook for converting time in Excel. If you want to learn a few more helpful formulas to add and subtract times, calculate elapsed time and time difference, please check out other parts of our Excel Times tutorial (the links are available at the end of this page). I thank you for reading and hope to see you again next week. 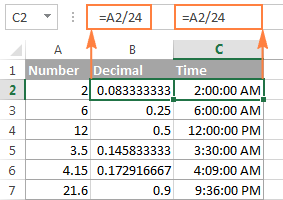 141 Responses to "How to convert time to decimal number, hours, minutes or seconds in Excel"
How can I get the difference between "1/29/2019 9:48:13 AM" and "1/27/2019 12:06:36 PM" in "HH:MM:SS" format, what formula I should use for such cases ? A decimal value of the duration. I am creating a sheet to calculate how much time it will take to perform a series of daily tasks. I have a set number of items that require 7 minutes of work per item. For instance, on Monday, there are 24 items that take 7 minutes each, for a total of 168 minutes. I need a formula that shows how many hours and minutes it will take. I can do the math myself and know that it takes 2 hours and 48 minutes (2 hours=120 minutes, plus 48 minutes). How do I get this to work in Excel? I am trying to calculate lap splits for track athletes. I would like to calculate this in minutes, seconds and hundredths of a second. If I have elapsed time entered into a spreadsheet. Is there a formula that would calculate lap splits? I use the Text to column, fixed width function but , when they are not the same number of digits in a row they do not split properly. Tried the Custom format by adding 0 in front of the digits and it shows 6 digits in each cell but when I try to use the Text to column it ignores the format. this is exactly what i'm searching for help on too. would love to see if anyone knows of a way to do this. I have time format in 1 days 3 hours 24 minutes. I need to change this to actual hours and minutes.